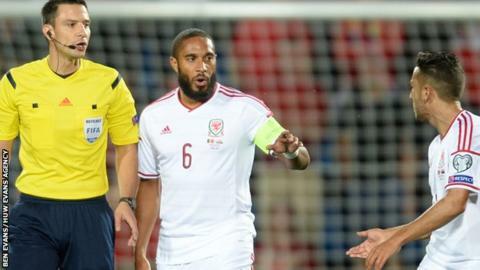 Wales captain Ashley Williams believes the rest of their Euro 2016 qualifying campaign will not be any harder than the hard fought 2-1 win in Andorra. On a controversial 3G artificial pitch, Wales were forced to come from behind with two goals from Gareth Bale. That was after Andorra, who have not won for a competitive game for 10 years, scored an early penalty. "To be honest I don't think it can get any more difficult whoever we play against," claimed Williams. "It was a difficult one and probably anyone that wasn't in the stadium doesn't realise how difficult it was to play on that pitch. "We are just happy to get on the bus with the points." Former Wales captain Kevin Ratcliffe and BBC Wales pundit at the game said: "We are very very lucky we have Gareth Bale otherwise we'd be criticising them a lot more than maybe we were." And ex-Wales manager Bobby Gould believed too many of Chris Coleman's side failed to perform. "People weren't seen. Aaron Ramsey, Joe Allen - they weren't seen throughout that 90 minutes. Perhaps they were adapting to the new system they were playing. "In saying that, they will have walked away from the airport saying 'I could have done better'. "They'll have to come back together and make sure they do play better in the next game." Like Gould, Williams praised Real Madrid's Bale for his two-goal contribution scoring with a header on 16 minutes and a free kick on 81 minutes. Gareth Bale says Andorra's new artificial surface is the &quot;worst pitch&quot; he has ever played on after Wales' Euro 2016 win. "He is what he is. We all know him. We are so pleased he plays for us," added Williams. But as well as Bale's individual display, Williams praised his team's resilience in difficult circumstances. "We couldn't run with the ball. We couldn't pass it. So it is going to take something special," he said. "I think it was a good game for us to show… our togetherness and just show our courage really - keep getting on the ball, keep trying do the right things, no matter what happened. Even when it was 1-1 we still kept doing it." Wales' win was also boosted by news that Cyprus created a shock in the other opening Group B game with a 2-1 win in Bosnia-Hercegovina. "We know if we take care of ourselves we will get where we want to be. But obviously it's nice to see a result [Cyprus' win] which probably helps you," added Williams. Wales host Bosnia-Hercegovina and Cyprus at the Cardiff City Stadium in October.